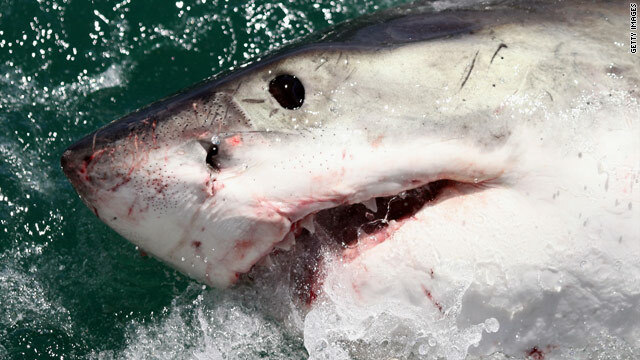 A great white shark, such as this one off South Africa in 2009, is suspected in two attacks off Russia's east coast. Swimming has been banned in the Sea of Japan off Russia's Far Eastern Primorye Territory after two shark attacks in the past week have left two people hospitalized, Russian media report. The first attack occurred Wednesday when a 25-year-old man lost both arms up to the elbow, Pravda reported. He was hospitalized in serious condition but expected to survive, according to the report. Witnesses said the shark was about 13 feet (4 meters) long with large fins, according to the Pravda report. The second attack occurred in a nearby area Thursday when a 16-year-old boy suffered severe wounds to his legs, RIA Novosti reported. The boy was hospitalized in Vladivostok, the report said. The boy's diving suit prevented the shark from taking his legs, according to a Moscow Times report. Authorities suspect the same shark was responsible for both attacks, according to the Pravda report. Alexander Sokolovsky, a candidate of biological sciences at the Far Eastern Department of the Russian Academy of Sciences, told Pravda that recent storms may have made the waters off Russia's eastern coast more desirable for sharks. "After a typhoon, the waters here become even better for sharks. The sharks are very sensitive to ecology, but the water here is clear," Pravda quoted Sokolovsky as saying. "They come here for food. When there is a shortage of their common food - fish and squid - they swim here searching for bigger food - seals, for example. Maybe the shark took those two people for seals." Great white sharks have been spotted in the region before, but these are the first attacks Sokolovsky has seen in 51 years in the area, according to Pravda. Authorities were putting together a team to find and kill the suspect shark, according to the RIA Novosti report. It's too bad that the sharks have been attacking. Maybe its time to realize these magnificent creatures have been hunted and killed for their fins, and then left to die horrible deaths. We as humans seem to have no regard for living creatures, just go to a fishing pier and see all the bait fish out of water, that is like putting someone underwater and watch them drown. We are killing our oceans and our wild life, when do we wake up..